I was thinking about my Dad and how he loves chili, year round when I decided to make this recipe. He always ordered it whenever it was on a menu, anywhere, anytime. I wonder what Dad would think of my barbecue twist? I might have to make it for him on our next visit. I love the simple twist of the barbecue flavor. It gives a hint of sweet that’s almost addictive. A splash of a vinegar based hot sauce when this is served amplifies all the flavors. Try a little of the Cholula Chili Lime, and no, no-one is paying me to say that! A big surprise? How good a scoop of my Roasted Sweet Corn Salsa was on top of my Barbecue Chicken Chili. I developed this recipe specifically to use some of the chicken & broth left from making my Honey Barbecue Pulled Chicken. Whether you cook the chicken in the Slow Cooker or in the Instant Pot, you’re going to be left with extra broth. Yep, it just sits there making you wonder if anything can be done with it. One of my mottos: Never waste flavor. That broth is going to have some barbecue flavor and it’s going to be a rich, chickeny broth. If you’re coming to this page and you haven’t made the Honey Barbecue Pulled Chicken? Scroll down a bit and I’ll give you some options. Or back up a bit and make the Honey Barbecue Pulled Chicken from my last post! It’s super easy and crazy good. Barbecue Chicken Chili can be made in the Instant Pot or on the Stovetop. Either way, please start with pre-soaked or brined beans. I’ve tried many recipes in my IP with dried beans that haven’t been soaked or brined and stopped doing it. The results just aren’t as good. Everyone tells you the recipes with unsoaked beans are great, but they really aren’t. For the best results use the brining options on this page: Soaking and Brining Beans. When you make this with Chicken from my Honey Barbecue Pulled Chicken, you’ll just stir the chicken in at the end to heat through. If you want to make this recipe and don’t have any Honey Barbecue Pulled Chicken, I feel sorry for you, ok seriously, use any pulled chicken or pulled pork or use one of the tubs you can pick up in the refrigerator section of the store. Just use chicken broth instead of a mix of chicken broth and the leftover broth from the pulled Honey Barbecue Pulled Chicken. Add a bit of bbq sauce to the chili, to taste. Easy peasy. Shop for your chicken well and know the highs and the lows. Chicken breast can run from 99 cents a pound up to $4.99 a pound and count on paying more for free range and/or organic. Buy the big family packs like I did for my Honey Barbecued Chicken and you’ll know every meal you make from it reflects that rock-bottom sale price. Dried Beans are an incredible bargain compared to so many protein sources. It does pay to shop around and it also pays to make sure you’re buying your beans from a source that has a good turnover. Old beans don’t cook well and can take hours to soften. If this happens to you, add more liquid and a teaspoon of baking powder, but with the rotation systems in most stores, that’s not too much of an issue any longer. A package of pintos is going to yield a little over 4 1/2 cups, about the same as three cans. So you do save over canned; usually about 1/3 of the cost. The difference probably won’t “break the bank” but with dried you do have a firmer, tastier (it will absorb some of the flavors and the bean will lend some flavor to what it’s cooked in) bean and you get to control the sodium and nix any additives. As far as the veggies in this Chili, including the peppers and the jalapenos, if you made the Honey Barbecue Chicken, hopefully, you listened and made the jalapenos! If not, you’ll want to roast some Jalapenos off. If you made the Roasted Sweet Corn Salsa, you’ll have extra bell pepper, cilantro, and cheese. Just use them in this recipe. The nice thing about Chili is that recipes are never set in stone. They can be changed up and fiddled with to your heart’s content and the difference between a whole bell pepper or a half makes little difference. 2 cups cooking liquid left from Honey Barbecue Pulled Chicken or a mixture of liquid and chicken stock to make 2 cups. As the vegetables cook, to a small bowl add the spices, the chili, cumin, salt, paprika, Mix together. When the vegetables are tender add the garlic, stir, then all the spices and herbs. Stir, let toast for a few minutes until spices become fragrant. Deglaze with the chicken stock/reserved cooking broth mixture. Add in the pintos, level them, then without stirring them in, add the tomatoes on top. Cover with lid fitted with liner, seal and set Instant Pot to High Pressure for 20 minutes. When done, allow to sit for 10 minutes on the Keep Warm function, then release the remaining pressure manually. Gently stir in the pulled chicken. If a thicker chili is desired, mix 2 tablespoons Masa Harina with 1/2 cup of the liquid in the chili. Set the Instant Pot to Saute and when it begins to simmer, stir in the mixture. Simmer for several minutes, paying special attention to the bottom of the pot; a plastic spatula works well for this. Turn off the Instant Pot, but continue stirring until the chili is no longer simmering. Garnish as desired with Sour Cream, Cheese and/or Cilantro. Arrange jalapenos in a row on a foil-lined cookie sheet, just touching each other. Place about 4 inches under the broiler. Broil until blistered, two to three minutes, then remove sheet and turn the jalapenos, broiling again until blistered. Repeat until all sides are blistered and slightly charred. 3 cups cooking liquid left from Honey Barbecue Pulled Chicken or a mixture of liquid and chicken stock to make 3 cups. Add more liquid if needed to cover beans by one inch. Heat a Dutch Oven with 1 tablespoon of oil until pot is hot. Add in the onions, bell pepper, and jalapenos and continue to cook, stirring now and then, until vegetables have softened. Add a lid, partially ajar, to speed up the process. As the vegetables cook, to a small bowl add the spices, the chili, cumin, and paprika, Mix together. When the vegetables are tender add the garlic, stir, then all the spices. Stir, let toast for a few minutes until spices become fragrant. Deglaze with the chicken stock/reserved cooking broth mixture. Add in the pintos and the tomatoes. At this point, there should be enough liquid to cover the beans by about an inch. Add more broth if needed. Partially cover and very gently simmer, small bubbles popping up now and then until beans are tender. Check at about an hour then every five minutes after that. When beans are done, add salt and gently stir in the pulled chicken. 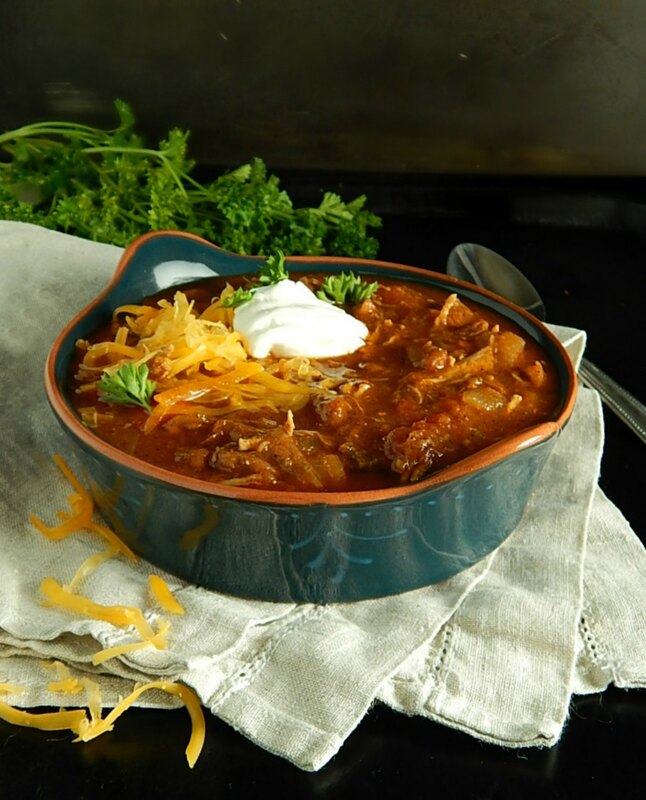 I’ll be sharing my Barbecue Chicken Chili at Fiesta Friday #233. Stop by to checkout all the links and stop by again on Tuesday to vote on your favorite ones! This entry was posted in Click here for Bargain Meals, Click here for Fabulous Food Posts and tagged Bell Peppers, canned tomatoes, Chicken, Chicken Breast, Chicken Stock, Chili, Dried Beans, Instant Pot, Jalapeno, pinto beans, Tomatoes. Bookmark the permalink. This looks wonderful! A great idea! I don’t own an inst pot and i never will, knowing my personality. Not just because it’s become trendy, I just have too much stuff! I feel that way, too! Stuff can just be a burden and my kitchen equipment is getting out of hand. But I do love my IP! Wonderful photos! Great way to use those peppers and chilli. Thanks so much! I do love how versatile chili is. These two recipes are keepers! Thank you, and thanks for the tip about jalapeños in the instant pot. I am definitely making them. Have you ever cooked a whole chicken in the instant pot? Do you think that would work with the honey bbq sauce? I haven’t done a whole chicken yet, and yes I think the honey bbq would be amazing on it – from the recipes I’ve seen, ppl usually cook the chicken and then add the sauce and toss it under the broiler. I have heard the chickens turn out really moist. Your photos are fabulous, too. Thanks much, Robin! Super simple. I peel them b4 I freeze them. Once I didn’t think about it and it was super messy to thaw and peel them.